Written by S. Theodore Baskaran. In January, about a hundred thousand people thronged Marina Beach in Chennai in a peaceful protest that lasted for five days, demanding the lifting of the ban on Jallikattu (bull-vaulting); a ritual sport held annually. A protracted legal battle by animal-rights groups had ended in the highest court of the country, stopping the ritual. 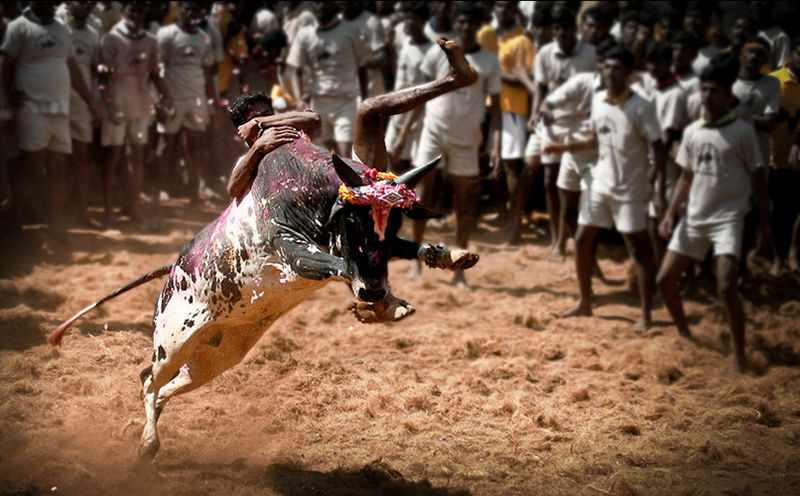 Jallikattu comes at the culmination of the four-day long thanksgiving festivities, Pongal. 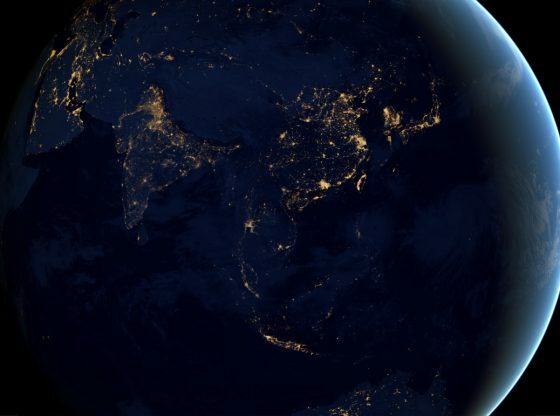 This follows the harvest in the month of Thai in the Tamil calendar (around Jan-Feb); when the sun after its winter solstice enters Capricorn, and begins its northerly course. The sport consists of letting a bull run within a given path (usually a road in the village blocked for the day). The tackler hangs on to the hump and runs with the bull for a given distance. One after another the bulls are released. The tacklers are most often farm hands in peak physical condition with electric reflexes. Accidents occur when some bulls, instead of running straight down the path, decide to turn and confront the tacklers. The unwritten rule is that even if human blood is shed not a drop of the bull’s blood can be spilled. Though most of the bulls entered are farm animals, some are reared specially for this sport. Ancient Tamil poetry has many detailed references to this practice. Most of them appear in Sangam literature (a group of literary works from the 2nd and 3rd century AD). At that time, the sport was called Eru thazuvuthal (hugging the bull). We learn that about the same period in history, bull-vaulting was also popular in Greece. On some of the Grecian wine jars at the New York Metropolitan Museum, I have seen scenes of bull-vaulting graphically illustrated. The scene is depicted in the pottery unearthed at the Aegean islands of Crete and Mycenae. Ptolemy and Pliny the Younger have chronicled the flourishing maritime trade between South India and Greece. It is tempting to surmise that these trade exchanges had a bearing on the ritual of bull-vaulting in these countries. This event is practiced throughout the south Indian state of Tamil Nadu. Some farmers raise bulls especially for this purpose and often it is a symbol of prestige to own one. These bulls serve as studs to sustain the native breeds of cattle of which there are quite a few. The final day of Pongal is geared around livestock. The cattle are bathed, the horns are painted and it is a free day for them. Crowds gather on either side of the arena. In the old days, a gold coin wrapped in a piece of cloth was tied with aloe fiber on the horns of the bull. The tacklers hung onto the hump of the bull and tried to untie this knot to get at this prize. No coin is tied now, rather, as a token, a piece of decorative cloth is wrapped around the horns. This ritual sport has continued for millennia with unfailing regularity until 2000 when trouble came in the form of ideas of animal rights from the United States. The thoughts of Peter Singer propagated through his book Animal Rights gave rise to the movement for which celebrities like Goldie Hawn lent their weight. Organizations such as the People for Ethical Treatment of Animals (PETA) came into being. Before long it reached India, where it was supported by celebrities from Hindi Cinema. However, when it crossed the shores, the movement took a different avatar. Though in America, the animal rights movement was not against meat-eating, it began preaching vegetarianism stridently in India where only about 29% are vegetarians. In states like Bengal, the figure is only 1.5%. Bear in mind that in India, vegetarianism is not a mere food-preference. It has religious, political and communal dimensions. After the right-wing wave, this has become a much-touted ideology. The eyes of Indian animal rights activists fell on Jallikattu while ignoring other travesties such as the plight of temple elephants kept chained or horse-racing. They argued that the bulls were tortured during the sport. The Indian religio-cultural landscape is often divided into two categories by scholars, such as Milton Singer into the ‘Little tradition and the Great tradition.’ The former covers the rural world of the peasants and workers and their village deities. It is to this realm that Jallikattu belongs. In fact, the procession for the event begins from a shrine of the village deity such as Ayyanar. The people of the ‘little tradition’ looked upon the legal ban on Jallikattu as an attack on their way of life. But the five-day peaceful, apolitical gathering on the sea front in Chennai, this January, soon took on a wider significance. Voices were raised against the indifference of the Central Government in the matter of Kaveri river dispute. Demonstrations were held against the apathy of the Government on the issue of the suicides of drought-stricken farmers. There were demonstrations against the imposition of Hindi in the Tamil-speaking area and other such long-standing grievances. In 1965, there was a state-wide protest against Hindi and Prime Minister Lal Bhadur Sastri promised in parliament that two languages – English and Hindi – would continue as the official language as long as the non-Hindi speaking states wanted. In this context, the bull-vaulting event remains an irresistible symbol for the Tamil speaking people.